Today we all celebrate OUR 43rd Earth Day. Earth Day is an annual day on which events are held worldwide to demonstrate support for environmental protection. It is now coordinated globally by the Earth Day Network, and is celebrated in more than 192 countries every year. 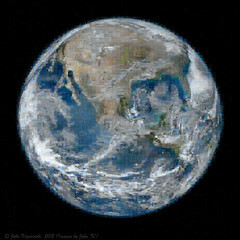 The name and concept of Earth Day was pioneered by John McConnell in 1969 at a UNESCO Conference in San Francisco. He proposed March 21, 1970, the first day of spring in the northern hemisphere. This day of nature’s equipoise was later sanctioned in a Proclamation signed by Secretary General U Thant at the United Nations. A month later a separate Earth Day was founded by United States Senator Gaylord Nelson as an environmental teach-in first held on April 22, 1970. While this April 22 Earth Day was focused on the United States, an organization launched by Denis Hayes, who was the original national coordinator in 1970, took it international in 1990 and organized events in 141 nations. Numerous communities celebrate Earth Week, an entire week of activities focused on environmental issues. Personally, I believe in that quote about borrowing the earth from our children. With that in mind, around our home, every day is Earth Day. However, though we compost, recycle, reuse and re-purpose, Earth Day always reminds me to try just a little harder. With respect to our environment and the generations to come, I hope you will do at least one new thing today that you can commit to doing daily. It doesn’t have to be fancy. If you don’t already have a recycling bin, call your city and ask for one. Stop using plastic bottles and get yourself a reusable cup/mug/bottle that you enjoy using. Use less paper. Start a compost (it’s truly amazing how quickly the right stuff breaks down in there!) Honestly, the list of things you can do to make this planet a little healthier is endless. We have only one Earth. Let’s be proud to pass it on to the next generations. Hoping you can get outside today and enjoy this earth. Great place to get some peaceandfitness on! Happy Earth Day to you. Earth Day 2013 – What Can you Do? 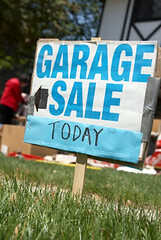 It took Mitch and I a while to actually have our garage sale, even though we thought about it for months. In our 30plus years together, we have had a few and we knew exactly what to expect. We were up at the crack of dawn and though we said the sale was from 8-1, by 8:05 we had had our first “rush” of customers which amounted to our first $85.00. We met and got to converse with some interesting people and of course we had our token customer who basically wanted everything for nothing, and she ended up walking away with a lot of clothes and coming back, later, for more. We certainly got in our exercise as it rained twice–meaning we had to lug everything back into the garage, and back out—and back in and back out. No complaints, we lifted, pushed, pulled and dragged, getting a better workout than most Sundays. And it meant no sitting around eating a big Sunday breakfast. When the rain got the best of us, we closed shop early with about 150.00 bucks. No money was spent on ads as Craig’s List and signs worked really well. Our trash (much of it was far from trash!) was happily gobbled up as great deals by some happy customers (best deal for a buyer—3 suits for 20 bucks!) and we were happy to bag up a lot of what was left and Mitch brought it immediately to our local Goodwill donation site. Our closets are much cleaner and the environment is none the worse for it. Remember, when you throw things “OUT” they don’t magically disappear. Think about where “OUT” is and know that a garage sale is a great way to reuse, recycle and re-purpose items that may seen like trash to you, but surely will be a treasure to someone else.